"When I am required to rig a character I run into problems one after another and eventually call it good long before it really is." Recently I read that one way to determine if your animation works is to turn off the sound. Can you still follow the story? A few days later, with that tip floating around my subconscious, I hear my four year old laughing herself silly. She was watching Pink Panther. I remember watching Pink Panther when I was a kid and laughing myself silly just like she was doing. Each episode was filled with things going wrong for the inspector and the Pink Panther just seemed to always come out on top. I sat down to watch with my four year old and realized that not only is Pink Panther still funny, it is an excellent tool / resource for studying animation techniques. Remember that "turn off the sound tip"? Here is a perfect example of that tip in practice. There is almost no dialog and yet even a four year old can follow along with the story. Lines of action are clear, the 10 principles of animation are used to great effect, silhouettes are boldly drawn and the characters have very expressive faces and body actions. This is classic animation at its best. So google Pink Panther and sit on down for some hysterically funny studying. Lee Salvemini returns with Volume 2 of his Character Creation series. The second installment will take the modeled Ninja and make it animation ready. This is truly a complete reference for rigging that you can come back to again at any point during your time learning Blender. Sebastian König has posted a video tutorial on Vimeo showing how easy it is to use face tracking data from easycapstudio.com in Blender. In addition to the video, Sebastian has posted a link to get tracking data from easycapstudio.com as well as a link for the model he used in the tutorial. control rigs and elegant shape keys. The first part will cover some essential rigging concepts, the setup of the deformation rig and creating an animator-friendly control rig with custom bone shapes. The second part of this tutorial (originally part of the first video) covers weighting, corrective shape keys and non-corrective shape keys. Sebastian König’s Mammoth gets rigged for animation at cmiVFX with the help of Nathan Vegdahl. One of the classic problems in 3D is how to rig tank treads. It’s sort of like a prime number problem in programming. It's easy to rig the tank tread in an animation with Blender, but it does not work in-game because the constraints in animation and games are different. I'm going to show you how to create a tank tread rigging system with a python script for the Blender Game Engine. Create many tread parts and make them run along a path. The distance of each tread part will be about 15-20 vertices of the path. Make each tread part rotatable by finding the slope of the current vertex that the tread is on and the next vertex in the path object. Then convert the slope to a value in degrees and rotate each tread part with this value. Create an engine and wheel object to place inside the tank treads. The solution is a little bit complex because some useful constraints do not work in-game. This means I have to create all the movement and rotation of each tread with the python script. Next, create an object to be the path by going to Add / Mesh / Circle. I set vertices to 500 and named this object "line". Then, modify it in edit mode for each tread part that will be running along the object. Copy all of the logic bricks from “wheel1” to the others by selecting “wheel2” to “wheel6”, and then select “wheel1” last. Go to Object / Game / Copy Logic Bricks. So, if I want these wheels to stop, rotate forward or rotate backward, I just change their state to 1, 2, 3 by python script or doing it directly. One characteristic of tank treads is that they are like a small piece of chain that connects together. For the example piece, the top is on the Z axis and the side is on the Y axis. You should place a small piece on the same axis that I have. Otherwise, you'll have a problem during rotation because I'll refer to these axes when I rotate each piece in the python script. Rename the tread to “tread_part.000”. Now create a script named "readVerts.py". I use this script to read all the vertices from the "line" object. The vertices have a vector data type that stores x,y and z coordinates. Many vertices are stored as a "list" variable, but each coordinate is a local coordinate of the "line" object. In that case, if I move a path to anywhere in the scene, the coordinate that I read is still the same, but I need something different. What I need is the coordinate data of each vertex in the path object that references from global (world). Therefore, each vertex that is read from the path object (local coordinate) just needs to be summed to the path position to give the global coordinate. By the way, all coordinates will be stored as “list” variables named “verts”. Make the “line” object call the “readVerts.py” script (Don’t forget to make this sensor call this script repeatedly by pressing the “…” button in front of the sensor, otherwise the coordinate data will not update if you call the script just once when the path moves). Create a script called “control.py” which has these 3 functions: * initMove() function : used to initialize movement state. running along the curve of the path. The problem is “How many degrees does that tread part have to rotate in each position of the curve?” The solution is to find the slope of the line between the current vertex and the next one, convert the slope into radians (m = arctanθ), and finally convert the radians to degrees. Now let’s examine lines 34-40. The tread part had the wrong rotation at some point in the path because it can only rotate in quatrain 1 and 2. The solution is to add or subtract 180 at the point that had the wrong rotation by checking the localY and localZ variable. Finally, line 42. Rotate the tread part by an amount of “degrees”. So each tread part calls this script only once when starting up. Create a script called “initwheel.py”. I use this script to read all the wheel objects a into list variable called “wheel” (line 6 from the python code, I use a short term assignment with list variables by using a “for loop” to read all objects whose names start with “wheel”). Create a script called “initpart.py”. I use this script to initialize the variable “i” by reading the last 2 positions of an object by using its name which is used to assign the position of each tread part (this is important as I’ll eventually create 32 duplicates of the “tread_part.000” whose names will be “tread_part.000” through “tread_part.032”). After this, assume i=0 to make the tutorial easier to understand. Create a script called “followline.py”. This script has functions like the“initpart.py” script but the difference is that the tread part will call this script repeatedly and check whether to run forward or run backward. Next, I’ve duplicated the “tread_part.000” object until I had 33 objects. You can either press duplicate (shift+d) 32 times or you can do this via a python script. After running the script “inittread.py”, I’ll get 32 duplicates of the “tread_part.000” (giving me a total of 33 objects) named “tread_part.000” through to “tread_part.032”. Next, move all the tread sets to layer 2.
again and extrude another bone away from the “Head” Bone with the E key. We repeat the process until we have given the body of the fish several Bones that end at the tail (four in total). We assign the names: “Bone 1” through to “Bone 4” for these Bones. From the Main Bone extrude one Bone, then another to give us the Bone that will move the front upper fin. We will call this second Bone “Fin 1”. From Bone 2 extrude two sets of Bones that will connect with the Bones that will work the rear upper and rear lower fins. Name these Bones “Fin 2” and “Fin 3” respectively. Notice that we eliminate the Bones that connect Bone 2 with the Fin 2 and 3 (see figure). clicking in the centre of the Bone. The most practical way to learn how to rig 3D models in Blender is to start with a basic and simple exercise. The following is a tutorial written for novices that want to learn this beautiful art. Rigging a fish isn’t that difficult and this will give us the basic knowledge to utilize the technique. Let us continue adding bones to our scene. This time we will make them by means of extrusion. Select the tip of the main Bone and with the E key, extrude the Bone that will move the head. Change the name of this Bone to “Head”. place them in the appropriate locations. Make sure you select the intermediate Bones between the fins and the Main Bone and eliminate them one by one. From the tip of Bone 1, extrude two more Bones for the body. From the tip of Bone 3, extrude two more Bones for the fins of the tail. The result should look similar to the following image. It is now time to give a name to our skeleton. We go to the Object panel represented by an orange cube. In the field that shows “Armature” we substitute it for “Fish Bone.” A quite appropriate name. With all the bones in their place, we now have to prepare the mesh of the fish to unite it to the skeleton. It is necessary to abandon the Edit Mode through [TAB]. Select the mesh of the Celacanto, and look for the “Modifiers” panel (represented by a wrench). In “Add Modifiers” we assign the option Armature and in the field object we select “Fish Bone”. scaling the root of the bones with the S key in Edit Mode. If done correctly, the envelopes will look like tin the figure. After this procedure, when you select the skeleton while in Pose mode, moving a bone will move the skin of the fish. Some imperfections can be corrected easily by toggling the “Envelope” option in the Armature panel. In this article we describe the implementation process in Blender of a new intuitive body rig we developed. Our goal is to provide an alternative to the common character animation techniques. For instance, our rig is very animator-friendly because it mimics forward and inverse kinematics with no need for FK/IK control switches or FK/IK matching. It also allows character posing as if doing drag and drop, causing an augmented feeling of control in animation. The rig works by freely selecting, dragging and positioning the controls of the hip, waist, hands, elbows, feet and knees. Rotation is only used in the joints of the hip, waist, hands and feet to achieve specific poses. Figure 1 shows the 3D model of a character (1) previously developed in our research group (the Porto Interactive Center) which is now used for testing the body rig (2) we developed for testing purposes. The hip, waist, spine and head use a single-bone based hierarchy. The arms and legs use two overlapping bone based hierarchies, one is the control bones and the other is the guide bones. The purpose of the first is to control the mesh of the character through skinning with squash and stretch abilities. The purpose of the second is to mimic the behavior of the first but not using any squash and stretch. The guide bones always maintain their initial proportion, which is anatomically correct. The goal is for the user to operate on the control bones (colored in yellow) using the guide bones (the joints colored in red) as a visual aid for anatomical character posing. The user can also do arm and forearm hinge rotation by operating on the purple bones. The control bones hierarchy is the one the user will be manipulating in order to animate the character. The 'elbow.L' bone allows positioning of the left elbow and 'wrist.L' allows positioning and rotating of the left hand. These will be used more frequently although the user can also rotate bones 'arm.L' and 'forearm.L' for a more accurate hinge. Table 1 shows the parent-child relationships for the control bones hierarchy seen in Figure 2. 'forearm.L' bones making sure their targets are the 'elbow.L' and 'wrist.L' bones respectively. This allows the control bones to have squash and stretch abilities. Be sure to define the armature object in the constraint parameters in order to have access to the target bones, as seen in Figure 3.
guide bones hierarchy seen in Figure 4. To keep the bones visually appealing for the animator we use custom shapes and three bone colors: yellow, purple and red. Figure 6 illustrates the end result for the left arm rig. Following this, we assign the Copy Rotation constraint type to the 'armDist.L' and 'forearmDist.L' bones making sure their targets are the 'arm.L' and 'forearm.L' bones respectively as shown in Figure 5. The setup in Figure 5 allows the guide bones hierarchy to mimic the rotation angles of the arm and forearm control bones hierarchy. But how will the user have a clear notion of the correct anatomical position of the elbow and wrist? This is due to the positions of the 'armDistTip.L' and 'forearmDistTip.L' bones in the guide bones hierarchy. These two bones are connected children of the 'armDist.L' and 'forearmDist.L' bones. The skinning of the rig of the arm with the mesh of the character is done for only the following control bones in the rig: 'clavicle.L', 'arm.L', 'forearm.L' and 'hand.L'. The body rig method described in this article is straightforward and flexible, causing a feeling of drag and drop operability. The rig is pleasant for the user because it is accessible and flexible, resembling the handling of a puppet. It requires the user to get adapted to it because it generates animation curves that the experienced animator may find different for tweaking. Nonetheless, we believe our control structure enriches character animation because it produces fast character animation results with augmented control. The rig is adaptable to different body morphologies with only minor adjustments. And the rig supports squash and stretch which is ideal for cartoon characters. Furthermore, the rig can easily be extended to the entire body, namely to fingers and toes. theoretical approach of using our body rig for motion capture to the VERE PhD Symposium, online at http://www.vereproject.eu/. For this issue of the BlenderArt magazine we chose to have a highly technical and less theoretical approach; more specific for character animation. We thank Teresa Vieira for the character design concept. If you have any questions e-mail us at ptbbastos@gmail.com. We anticipate improvements such as constraining the control bones to the guide bones when the user may require enhanced joint positioning. We didn't worry too much about the custom shapes; X-Ray could be prevented to make it easier to understand the visual controls. We provide a video showing animation tests of the rig and a walk cycle for the character that we were able to build in less time and with less effort than using common methods. I found Blender 3 years ago and liked it very much. I found that Blender, as open source software has its own potential which other proprietary software doesn’t have. Aaahh! I don’t even have one of these .... what are you talking about man? If you do know these skills then it would be an advantage for you, but if you don’t then there’s no need to worry .... You can still animate like the experts ... the learning method will just be different ... that’s it. These are the main things, but don’t be afraid. They all are related to each other so there will come a time where you never have to be reminded of all of these principles. You'll just do it with your own creativity and knowledge. example.. hope this helps more. In the diagram we have our car going from home to a parking lot. This a very simple example, easy to understand and quite fun to learn. Imagine that you have your car at home and you want to drive it to a parking lot. What you would do is start your car, drive slowly out of the garage and then race your car on the open road like no one can stop you. Finally you brake to park your car at the parking lot and then slowly park in a parking space. So that's how this thing happens. You now have one thing clear in your mind; how the car will move from one point (your home) to another (parking lot). Now let’s decide timing. stopwatch. In this way you get your timing. See? It’s easy and the next part is way more exciting than this one. Now we will decide spacing. Spacing is one of the most important things in animation, but before we jump right in, keep in mind that we are not going to open Blender just yet. We will move to Blender after spacing has been decided. Proper spacing gives your animation very good ease-in and ease-out. Sometimes it’s very helpful to register poses and give weight to your animation. The car starts slowly, gets up to speed and then eases in slowly at the end. But in this picture you can see lots of pictures when the car starts and stops and very few in the middle when the car has some speed. From this we come to know that faster objects need very few keys and slower objects need lots of keys. That's how we did this in 2D. But don't forget we have the power of 3D and we have a very powerful thing called Blender. Let's have a look at the same example with a different perspective. So now we use Blender and it means we don’t need to setup this many keys, because all 3D software sets the inbetween keys very well. Look its not true everyone. If you make your PC do the wrong thing then it will, but if you put some effort in and proper keys on proper timing then you will surely be surprised by the end result. Ok, now I'm using Blender but how will I set up my keys like that? Well, you need some basic 2D knowledge to set your keys like that right? Naaaaaaahh I don’t think so, don't ever think like that. In 2D animation it’s much harder than it seems. It will take lots of time to achieve a sense of spacing. But if you wanna make it in 3D we have some cool tricks to make it easier. Let's assume we have a car model in Blender. Just have a look at the spacing and forget timing for awhile. Set your 1st key on your 1st frame then move the car bit further and place another key on the 20th frame. Now the car is traveling from one place to another place in 20 frames. Our 1st key and our 20th key are our contact poses. animation a flow. A breakdown key describes how to reach from one contact pose to another with a perfect arc and it lets your audience understand the movement better. Without it our animation looks flat and linear which we don’t want. So let’s add a breakdown key. So you started with something like this. Keep in mind that breakdown keys are always in the middle of two contact poses. So we have our breakdown key on the 10th frame. After adding a breakdown key, let's add “inbetween” keys that we will call IB. And now the magnet is attracting your next pose so it would be something like this. So when we combine our frames with this image we will get something like this. IB keys gives your animation smoothness. It’s very important for ease-in and ease-out and many other principles too. We have added IB keys on the 5th and 15th frame. IB keys are always in the middle of breakdown and contact keys. So now you have only five keys. See how easy it was. You can see that the pose on the 5th frame is attracted to the 1st pose and the same is happening with the next IB key (#15). It’s attracted to the next contact (#20). 20th. From this you will get surely fluid action in only 5 keys. I hope this helps, remember practice this principle daily. Take 3-5 contact poses and think like they are magnets attracting all the IBs. You will surely learn a lot. You might find this tutorial different from others, maybe because I'm self taught, but donâ&#x20AC;&#x2122;t worry I'm learning it in my way and it always works for me and I hope it will work for you too. As an artist you might think that python scripting is a complicated and boring task, but this is far from the truth. If you know a few basic principles it isn’t very hard to do and it can actually save you time on doing boring tasks. Moreover, it even enables you to achieve results that are near-impossible without scripting. This tutorial gives you a first introduction to python scripting in Blender and will enable you to start writing your own scripts. Therefore it will mainly focus on general methods of writing a script, which you can use in all kind of situations. Note: if you wish to skip the first technical introduction you can start reading at Phase 2 and refer back to Phase 1 if there is something you don’t understand. However if you have no experience with Python I suggest you start at Phase 1.
utility script for modellers. When modelling from a reference, it’s useful to have a background image. Unfortunately Blender doesn’t allow you to easily toggle between two or more opacity values for these images. So let’s add this functionality ourselves. Box1. In Python the level of indentation is important. Changing the level of indentation will change, or even break, the script. An easy way to remember is that whenever you use a colon (:) the next line has to have an extra level of indentation. By convention we use 4 whitespaces as one level of indentation in Blender. currently does. As shown in figure 1, the script can be divided into 5 parts. Part 1 is needed to get access to Blender’s functionality in Python. Below part 1 we get several code blocks that start with either class or def, respectively defining new classes and new functions. To understand the script, we can skip these blocks for the moment as they aren’t called yet, they’re just being defined. This brings us to the final part (part 5), where you can see that if __name__ is equal to “__main__”, the register() function is called. The important thing to remember is that in Blender this condition is only met when the script is run from the text-editor. You can run the script by pressing the Run Script button in the header, or by pressing [Alt + P]. This calls the register_class function which is part of the utils module, which in turn is part of the bpy module (which we imported in part 1). This function registers our own operator, or panel or menu, with Blender. Enabling us to use our custom code inside Blender. The operator we make it register is defined in part 3. Part 3 is where things get interesting. So far we’ve only seen code that is basically the same for all functionality you want to add to Blender, but what we write in our custom operator defines the new functionality. What follows is some explanation about the required parts for defining an operator: The bpy.types.Operator argument (line 9) tells Python that we are subclassing from Blender’s default operator struct. For instance, If you wanted to create a panel instead of an operator, you’d have to subclass from bpy.types.Panel. bl_idname and bl_label are respectively the official name Blender uses inside its RNA structure and the name displayed to users. the operator can be used or not. If it returns a value of True, the operator can used. If it returns False, the operator can’t be used. In this case it checks if there is an active object. For more information on Python syntax, like the comparison sign != , read box 3. Finally the execute() function is executed when you call the operator. The final line (line 20) is obligatory, but before that you can do anything you want. In this case we call the main() function. Box2: For easier code writing, enable the display of line numbers and syntax highlighting. This can be done in the header, see the image below. To get feedback on errors it’s useful to also enable the console. This can be done in the info header: Help >> Toggle System Console. The current main() function in part 2 prints all objects in the scene to the console. This isn’t what we want, but we’ll change that in phase 2. Let’s first have a look at how we can test our code. The first critical step is to run the code [Alt + P], if you haven’t done so yet. if you look at the console (see box 2), you’ll see that all objects are displayed over there. You can use [file2.blend] to start from here. It’s time to stop analysing the existing script and write our own functionality. As a first step, remove the content of the main() function. So delete lines 5 and 6.
bpy_struct, which is the base class from which all types in Blender are subclassed. This also holds true if you are looking for other types. When you arrive at the correct page, there are two important places to look for further clues. The first is at the top of the page, where it states the base classes. The second place is at the bottom of the page, where it displays the references. For BackgroundImage there are no interesting base classes, just the basic bpy_struct class. At References you can see that the background figures are stored as part of the SpaceView3D. Follow the link. At the top of the page you can see that Space is one of the base classes of SpaceView3D. This makes sense as the 3d view space is a type of space. So let’s take a look at the Space entry. The Space type has no base classes, except from bpy_struct, which we’ll ignore. At References we find an interesting bit: Context.space_data. This is interesting, because the context is something we have simple access to. We even already have it included as an argument in the main() function at line 4. Background figures are stored in SpaceView3D. Run the Script and test it by executing it via the search menu. If you’re using the example blend-file it should now have printed 0.5 to the console twice, which is what we’re expecting. The next step is to change the opacity instead of just printing it. Let’s say we want to toggle the opacity of the figures between 0.1 and 0.5. So first we check the current opacity and based on that we change it. This is done by using an if/else structure. Replace the print() statement with the following and mind the indentation when you’re adding it to your own script. using [file3.blend] as a base. We now have an operator that does what we want, but accessing it via the search menu isn’t very convenient. Let’s add a hotkey for the operator. For simplicity we’ll use Q as a hotkey, as it’s still free in the default keymap. Add the following 3 lines to the register() function. is that floats aren’t 100% accurate. They might have a small deviation. So 0.1 could actually be 0.1000001. If you test the script it should now already do what you want. We still have some cleaning to do like changing the operator name. You can try this yourself and compare it with the code in [file3.blend]. You can deduce these lines as we did in Phase 2, by starting with KeyMapItem as a search term. You can also just copy/paste these lines in any script you need. You can use [script2.py] for finding all the internal names of the different keymaps. In our example: ‘3D View’. If we run the script now, we can test it by simply using the hotkey [Q]. As a final touch we’ll add a button from which the operator can be executed. For this script the hotkey access is much easier, but for some of your own scripts a button might be more useful. Block and navigate to your 2.57 folder. This is usually located in the folder where you installed Blender. Navigate to scripts >> startup >> bl_ui and open the script that contains the panel you need. In our case space_view3d.py. Doing a search for background, [Ctrl + F], you can find the name of the panel class at line 2199 (might vary for your version of Blender): The next step is to incorporate this into our script. First define a new function which we’ll prepend to the panel. Define this above the register() function. You can find the different options for the layout at this API page. The final thing to do is prepending this function to the panel. If you look at the API page of the Panel class, you’ll notice 3 class methods at the bottom: append, prepend and remove. We’ll use prepend() to add our button. Add this to our register() function. We are done now and can use the newly created button to call our custom operator. There are several useful websites you can use for scripting. You can find the final script in [file4.blend] and as [script1.py]. So what to do now? There are several changes you could make to the script. For instance you could try to make it toggle between 3 values, instead of just 2. You can find an example of this in [script3.py]. If you want to increase your experience, you could also try to write a new script. Iâ&#x20AC;&#x2122;d suggest writing a script to mass toggle the displaying of object names. And for an extra challenge: have it only work on selected objects. You can take a look at [script4.py] to see a possible way of doing this. BlenRig is an Auto Rigging & Skinning System for the Blender 2.5+ series created by Juan Pablo Bouza (jpbouza). It features an adjustable rig whose proportions can be changed to fit existing models, or to create a new character based on a previously rigged mesh. The system consists of an Armature and a strategically modeled Mesh Deform body cage. This allows the user to be able to skin characters with very little or no weight painting at all. This rig was built up exclusively with Blenderâ&#x20AC;&#x2122;s default constraints and drivers, but there is an additional Blender Addon (by Bart Crouch) that can be installed in order to be able to access a dedicated GUI. From here you can directly manipulate the different control modes of the rig (FK, IK, Hinge and Stretchy controls) and several extra functionalities, like the Rig Baking buttons. For the release of BlenRig 4, Juan Pablo created 3 fully rigged character examples. All 3 characters are available for download under a Creative Commons License at: www.jpbouza.com and also at BlendSwap. Apart from this, the good news is that BlenRig 4 also has 5 video tutorials that can be found here: Or at Youtube and Vimeo. the wheel. That’s when Bishop 2.0 came to life. When Animation Mentor first released its Bishop rig to its students in March 2005, he had a fresh new look. Bishop was exciting for industry professionals and students as most animators used a limited stock of free rigs that were available to everyone. Five years — and more than 1,000 graduates later — all of the completed acting tests and short films using Bishop started to give him that dated feel. After all, he was the rig on all student reels and showcases. From noses, lips, chins, head shapes, brow shapes, hips, bellies, legs, arms, chests — we created over 100 new targets for each new shape! We first talked about morphable rigs and researched different methods on how to best accomplish this — but in the end, we decided to use a combination of blend shapes and deformers. Step one: Create and setup some basic head and body blend shape targets as a proof of concept. In addition to our team in the office, we worked with Animation Mentor alumnus, Keith Ribbons, to create the first few head and face shapes. We created facial transition tests. Then we created two short tests showing the rig morphing from one rig to another — for example, changing the noses, changing the body shapes and even changing from a woman to a man! Once we created a successful proof of concept, the excitement set in and we got to work on creating Bishop 2.0. We learned a few valuable lessons along the way — none more important than running “smoke tests.” Early on, we would spend a couple of weeks in rig development, only to find that we needed to start from scratch due to a small issue we hadn’t caught, such as: Too many faces. A blend shape target had too many faces and therefore did not match up. Heavy weight. A new blend shape improperly influenced weighting on one part of the original rig. use. Our number one goal was to create a rig that would open up various new character designs for our students, maintain the ease of use of the rig and make the new process of creating a character quick and simple. Accomplishing the goal also brought on new challenges, such as keeping the file size down. Each article of clothing and blend shape target contributes to the file size. Through a series of scripts, and with the help of our partners and friends at AnimationRigs.com, we created a solution that guides the user through the character creation process. Here, students can resource a single panel to create a new character and be ready to animate in just a few minutes. To resolve these types of issues, we created a few different scripts that we ran as smoke tests on the rig. Every day, we would put the rig in a pose that used every control. We wanted to push the extremes to ensure that our animators could confidently pose the rig without the risk of the geometry exploding. Smoke tests are key for anyone in rig development. Alexiss is the content administrator and an animator at Animation Mentor in Emeryville, California. She started her university studies at Brigham Young University where she received a bachelor’s in Psychology in 2006 and then started as a student at Animation Mentor the following January. After finishing her student short film 18 months later, she joined the team at Blue Sky Studios as an animator to work on Ice Age: Dawn of the Dinosaurs. In January 2009, she moved to Lumenas Animation Studios to work on The Legend of Santa Claus. Nathan Vegdahl's Rigify turned the Blender world upside down. With the addition of an auto rigging macro, a process that took expert riggers days or weeks can now be reduced to a matter of hours by a n00b. So what's the next frontier of rigging? Pimping your Rigify rig! Already a number of tutorials have surfaced, showing how to mod Rigify to include face rigs, animal parts, etc. I used Rigify as a starting point for my Cataphract rig, before modifying it to have lots of crazier anatomy: multiple heads, a tail, squash-and-stretch splines for the necks, spine and tail, and inverse kinematics (IK) functionality for the neck, spine and tail. Most projects won't need that level of cartoony rigging. However, a quick change to the default Rigify rig can at least get you rocking out to some stretchiness on your arms and legs. The process is tedious, but thankfully short! Start by using Rigify in the default manner. Add a human meta rig, and in edit mode change the bone locations around until they fit your character's frame. Once that's done, on the Object Data properties panel, click "Generate." You've got a rig all set and ready to use. Now let's make its arms and legs stretchy! 1. On rig layer 19, select MCHshin_ik.L. Under the bone properties menu in the Inverse Kinematics tab, change the stretch to .001. Repeat for every IK bone: shin, thigh, arm, forearm. this on DEF-forearm.R.01, DEF-shin.L.01 and DEF-shin.R.01, but with relevant targets. In other words, DEF-shin.L.01 will copy the rotation of ORG-shin.L and Stretch To DEFfoot.L. 5. Select DEFforearm.L.02. In edit mode, change its parent to DEFforearm.L.01. On its Damped Track constraint, change the target bone to ORGhand.L. Repeat this process with DEFforearm.R.02, DEF-shin.L.02, and DEFshin.R.02 but with relevant changes. In other words, DEF-shin.L.02's new parent will be DEFshin.L.01, and its Damped Track constraint's target bone will be ORG-foot.L. That's it! If you are unfamiliar with Rigify you may have trouble identifying where the changes happened. Turn on the IK bones and switch their FK/IK attributes to 1. Now, when you move your IK controllers around, the deform bones stretch to meet them! ... a guide to explain just the few important options needed to get me started. "This book does not aim to be exhaustive and yet it is not written to an overly simplified manner so as to insult your intelligence. 3D animation by its very nature is not simple. What you have with Beginning Blender is a book that covers a good range of the many different areas of Blender, with practical examples to get you fast-tracked into using those areas." In this review I am going to focus on the two rigging chapters. It is amazing how much information Lance packed into these two chapters alone. And even if for some bizarre reason you weren't interested in the rest of the book, these two chapters would still make it worth owning. Chapter 7 covers basic rigging and animation. Lance covers keyframing, the dopesheet (which was cool because I hadn't played with that yet), parenting, the graph editor, pivot points (restricting movements), basic tracking, bone explanations and basic rigging of a character. One of the examples for this chapter teaches basic tracking by showing you how to set up “Eyes that Follow”. Now this is a right handy example and something that you will find yourself referencing for most if not all characters. useful rigging tips that make animation easier, such as putting a little bend in joints like elbows and knees. Once you have gotten comfortable with basic rigs, it is time to move onto chapter 8, “Advanced Rigging”, where Lance ramps it up a notch. First off he explains Forward and Inverse Kinematics and their uses. There are great examples in this chapter, starting off with an IK arm. You are shown how to set up the arm and then walked through setting up constraints to make it behave properly. Once your arm is set up, Lance then shows you how create and set a custom bone shape for your new IK arm. We look advanced already. easier to animate once made. These examples make easy work of creating some of the more tricky and advanced rig components and are covered in a way that makes it easy to flip back and reference them as needed. Which in my case, is every single time I need to build a rig. Rigs of course are not overly useful if you don't know how to animate, so Lance takes you through a complete walk cycle. I liked how he sets up his walk cycles and the tips he gave along the way, especially the little details, like peeling of the feet. nkscape is an excellent vector tool for a graphic designer. While it may have been true that like all OSS softwares the popularity and adaptation was restricted due to non availability of information available. Situation for Inkscape was no different but now we have lots of books available from different publishers. The recent book to come out of Packt publishing's stable is 'Inkscape 0.48 Illustrators Cookbook written by Mihaela JurkoviÄ&#x2021; and Rigel Di Scala. This is an unusual choice of book title 'Illustrators Cookbook', it would appear that the book is targeted specially at illustrators by the means of topic covering graphic design for illustrators but not quite so this book is generic in approach towards Inkscape's tool set. Chapter 2 Editing Colors: covers colors, strokes and editing gradients. Chapter 3 Speeding up your work flow: covers all those support tools in a vector design tool illustrator can't leave without, like align distribute, grid, guide and snap etc. Chapter 4 Creating and editing clones: This was the chapter what most intermediate users will be reading diligently, it covers clones. tiled clone and creating patterns out of tiled clones. Chapter 5 Live path effects: Another delightful read for getting into the detail of powerful feature set available in Inkscape to manipulate paths, one of the most significant toll in any vector drawing tool. There are various small how to dos which excite like patterns, using the new 3d box tools and rail sleepers to name a few. They give you something to look forward to in each chapter. So who is this book for you might ask, through book mentions its for intermediate to expert I would put it at beginner to intermediate reason being that this book presents itself in a manner more suitable for learn and refrence. Chapter 6 Extension: It covers various tools such as Lsystem generator, 3drendering and barcode generator etc. Chapter 7 till 11 the book continue with additional features and recipes. There is plenty of action to learn from those. - Photograph: As PNG and maximum width of 256Px. (Only if submitting the article for the first time ) - About yourself: Max 25 words . - Images should be named/labled likewise (image1 or - Website: (optional) img1 etc). 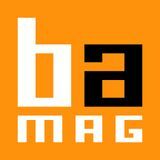 Note: All the approved submissions can be placed in the final issue or subsequent issue if deemed fit. All - Provide proper captions for images if and when submissions will be cropped/modified if necessary. needed. For more details see the blenderart website. - Image format prefered is PNG but good quality JPG BA takes no responsibility fo the material in any form can also do. and the submission will automatically mean that - You can submit inline images in documents like you have agreed to the blenderart terms and DOC or Openoffice ODT etc but make sure the conditions for submission for more information images were properly names before importing them please do read the disclaimer. in docs. 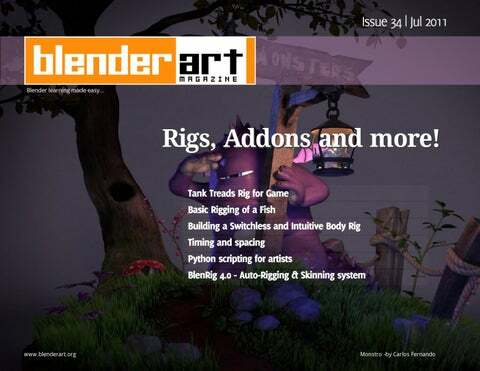 BlenderArt Magazine Issue 34 Rigs, Add-ons and More!